"I'll get you another cup of coffee, my pretties! And your little dog, too!" OK, she never said that, but in my eight-year-old mind, that's exactly what Wicked Witch of the West Margaret Hamilton was cackling when she started popping up in Maxwell House commercials in the mid-'70s. For a generation terrorized by her performance in "The Wizard of Oz," how could she ever be perceived as anything but a flying-monkey-owning enchantress? In the commericals, Hamiltion played Cora, a homey but persnickety New England shopkeep, and talked a lot about how her little store could only stock one brand of coffee, so she chose Maxwell House. And then she tried to light a scarecrow on fire. Wait, that wasn't in this. But Cora was probably thinking it, even while she was playing checkers with her customers or closin' up for the evening. In real life, Hamilton was apparently the exact opposite of the green-faced baddie she played in the movie. She reportedly loved children, and supported charities that benefitted kids and animals. She even appeared on "Mister Rogers' Neighborhood" to explain that she was only playing a role, and she wasn't really mean. We tried to dig up that clip, but came up empty. (If anybody knows where we could find it, please send it our way.) 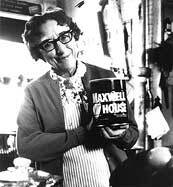 But we did find a couple of Maxwell House commercials. Mmm...good to the last drop. My pretties! In the early 1980s, a friend of mine made a documentary about her as his film school MFA project. He always described her as being a very nice lady.